Automated quality control is becoming more and more important. Quality control systems from SICK fulfill all reliability and process stability requirements in the field of industrial production, whether they are used to measure geometric dimensions, for surface inspections, or for completeness checks. They guarantee improved production process planning, higher throughput rates, and reproducible product quality. 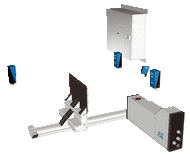 Each system combines sensors and software to form a reliable complete solution.